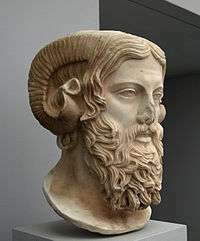 Amun (also Amon, Amen; Greek Ἄμμων Ámmōn, Ἅμμων Hámmōn) was a major Ancient Egyptian deity. He was attested since the Old Kingdom together with his spouse Amaunet. 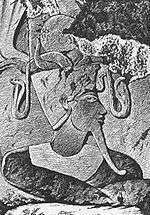 With the 11th dynasty (c. 21st century BC), he rose to the position of patron deity of Thebes by replacing Monthu. Amun and Amaunet are mentioned in the Old Egyptian Pyramid Texts. 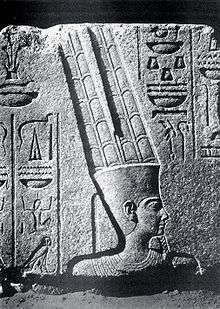 The name Amun (written imn) meant something like "the hidden one" or "invisible". Major construction work in the Precinct of Amun-Re took place during the 18th dynasty when Thebes became the capital of the unified ancient Egypt. Construction of the Hypostyle Hall may have also begun during the 18th dynasty, though most building was undertaken under Seti I and Ramesses II. 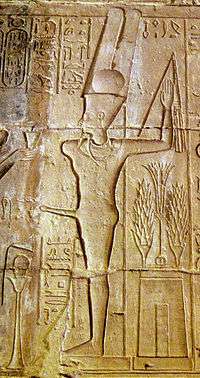 Merenptah commemorated his victories over the Sea Peoples on the walls of the Cachette Court, the start of the processional route to the Luxor Temple. This Great Inscription (which has now lost about a third of its content) shows the king's campaigns and eventual return with booty and prisoners. Next to this inscription is the Victory Stela, which is largely a copy of the more famous Israel Stela found in the West Bank funerary complex of Merenptah. Merenptah's son Seti II added 2 small obelisks in front of the Second Pylon, and a triple bark-shrine to the north of the processional avenue in the same area. This was constructed of sandstone, with a chapel to Amun flanked by those of Mut and Khonsu. Jeremiah 46:25 The Lord of hosts, the God of Israel, said: “Behold, I am bringing punishment upon Amon of Thebes, and Pharaoh and Egypt and her gods and her kings, upon Pharaoh and those who trust in him. ↑ Hart, George (2005). The Routledge Dictionary of Egyptian Gods and Goddesses. Routledge. p. 21. ISBN 0-415-36116-8. ↑ Sweek, Tracey; Anderson, Julie; Tanimoto, Satoko (2012). "Architectural Conservation of an Amun Temple in Sudan". Journal of Conservation and Museum Studies. 10 (2): 8–16. doi:10.5334/jcms.1021202. ↑ "Ammonia". h2g2 Eponyms. BBB.CO.UK. 2003-01-11. Archived from the original on 2 November 2007. Retrieved 2007-11-08. Chisholm, Hugh, ed. (1911). "Ammon". Encyclopædia Britannica (11th ed.). Cambridge University Press. Cruz-Uribe, Eugene (1994). "The Khonsu Cosmogony". Journal of the American Research Center in Egypt. 31. JSTOR 40000676.